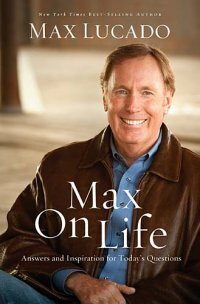 As a writer and ministry worker, Max Lucado has received many questions throughout his life. Max On Life is a collection of one hundred and fifty of these questions and his answers. The questions are divided into different grouping such as Hope, Hurt, Him/Her, ect. There is a little something for everyone in this book. I love that Max bases all his answers on scripture. My favorite thing about the book is that if I have a problem with something in my life I can look up a question that's related to what I'm going through and find a scripture to reference. Obviously, since he answers so many questions the answers are short (about a page each). I feel like this is a good reference book (a start), but doesn't go in detail or at length on any subject. Whole books can be written on just one of these questions or topics. While I did like the scripture and his writing is easy to read, it took me awhile to get through this book. Questions that I had were very interesting to me, but many I could not relate to or I already knew what he was going to say. I would give this book a 3 out of 5 stars.